Autism moms are warriors. It’s true. Raising a child with autism is overwhelming, to say the least, and it’s impossible to predict how each day will unfold. Even the slightest change in routine can set your little one off, leaving you feeling as though you’re constantly walking on egg shells in an attempt to keep the peace, which is exhausting. Sometimes it feels as though no one in the entire world understands what you and your family experience on a daily basis, and other times you feel overwhelmed with gratitude for the people who go out of their way to help you. The days are long, and since autism and sleep disorders tend to go hand-in-hand, the nights can feel like an absolute eternity for parents of autistic children. And unlike your friends with ‘neurotypical’ children, leaving this kids with grandma and grandad for a weekend so you can catch a break and enjoy a little R&R with your significant other just doesn’t seem possible – or fair – when you have a child with special needs, and it often feels like each time you (finally) find your footing and get a chance to catch your breath, life throws another hurdle your way. But, let’s be honest here: autism moms have a lot to be thankful for. It’s just harder to see the forest for the trees (so to speak) when you’re an overwhelmed mom in dire need of a break. We live in a day and age where we are expected to put everyone’s needs before our own, but what we fail to realize is that there is only so long we can live in a constant state of stress and fatigue before our bodies start to breakdown and even the smallest tasks start to feel overwhelming. And when autism moms feel overwhelmed, the effects can be detrimental on the entire family. I’m serious! Your child’s success with various treatments and therapies is very much dependent on YOU, and I’m not just talking about the physical involvement of driving her here, there, and everywhere. I’m referring to the emotional part as well. The parts that require you to engage with therapists and teachers and nutritionists and get onto your child’s level and connect with her so she feels like there’s at least one person in this world who is on her side. By ensuring you are at your absolute best, both physically and emotionally, you are giving your child the most important gift you can give her: YOU. Of course, this all sounds great in theory, but finding ways to catch a break and recharge can feel downright impossible when you have so many demands on your time each day, which is why we put together this list of tips to help overwhelmed autism moms. 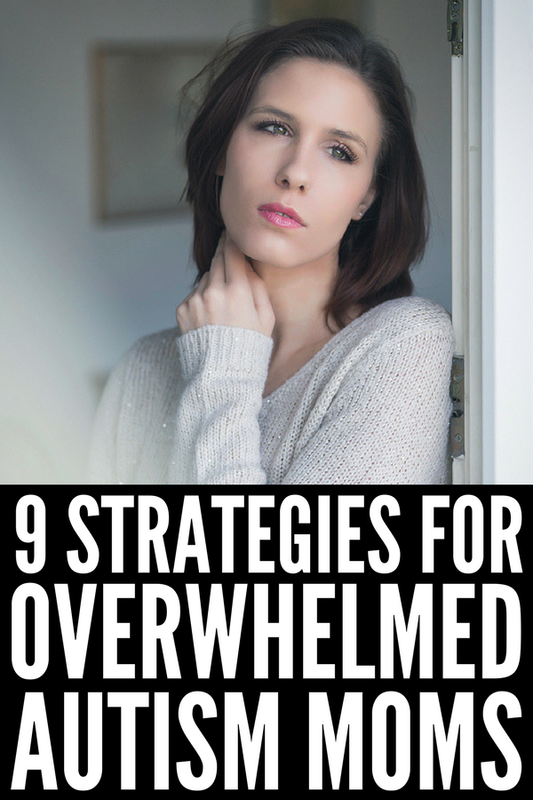 Before we jump into our best parenting tips for overwhelmed autism moms, I wanted to take a moment to remind you that it’s completely normal to feel overwhelmed. EVERY mom feels overwhelmed! And when you add in an autism diagnosis, and everything that brings along with it, it can feel all-consuming and extremely difficult to know which way is up. If this sounds like you, a great first step in figuring out how to have more balance in your life is to write down everything you are responsible for each day. And I mean everything! Do this everyday for a week, and then set aside 30 minutes or so to go through your list and categorize each item as Essential, Important, and Unimportant. Next, get in the habit of writing out a daily plan each morning in which you prioritize the essential items first and the unimportant tasks second (I like to use The Productivity Planner to do this as it is set-up to ensure you are structuring your day in the most effective way possible). All unimportant items should either be delegated to someone else or removed completely. 1. Stop feeling guilty. As previously mentioned, motherhood is overwhelming. Period. And as much as we’re taught to put ourselves on the backburner so we can take care of our loved ones, we must remember that an imbalance in our emotional health can lead to physical issues such as chest pains, ulcers, and high blood sugar, as well as emotional issues like stress and depression. Our emotional health impacts how we feel about ourselves. It also enhances the quality of our relationships, and effects how we deal with our feelings and handle difficulties. So the next time you feel guilty for wanting a little time to yourself so you can catch your breath, I urge you to let those feelings go and give yourself a little grace. 2. Make self-care a priority. While it might seem impossible to find the time to work on a hobby or project of your own when you’re juggling therapist appointments and IEPs for one child, school and extracurricular activities for another, as well as all of the other responsibilities that come with being an adult, finding ways to get some R&R and focus on something you’re passionate about outside of being a parent and spouse can do wonders for your soul. Enroll yourself in pottery lessons, teach yourself how to knit, take a cooking class, book yourself in for a manicure, grab coffee with with a friend, or start a blog! Whatever you choose to do, make time for it. You deserve a break, and will feel much more relaxed and rested afterwards, which will have a positive impact on the care you are able to offer your family. 3. Identify your ONE thing. One of the most powerful books I read last year was The ONE Thing: The Surprisingly Simple Truth Behind Extraordinary Results by Gary Keller. In the book, Gary introduces the idea that behind every successful person is their ONE Thing – the thing that stands between them and their goal. He asks, ‘what’s the ONE Thing you can do this week such that by doing it everything else would be easier or unnecessary?’, and then compellingly demonstrates that extraordinary results are a result of how narrow our focus is. Remember that your ONE Thing doesn’t need to be work-related. It could mean hiring the right supports for your child, finding reliable respite care, delegating household tasks, or focusing on getting your health in order. The idea is to figure out what is standing in the way of the goals you have set out for yourself, and then focusing on achieving that one thing so that everything else falls into place. 4. Prioritize. I touched on this earlier, but just in case you skipped ahead, a great first step in figuring out how to have more balance in your life is to write down everything you are responsible for each day for a full 7-day period. Once this is complete, set aside 30 minutes or so to go through your list and categorize each item as Essential, Important, or Unimportant. Next, get in the habit of writing out a daily plan each morning in which you prioritize the essential items first and the unimportant tasks second (I use The Productivity Planner to prioritize my day because it is designed specifically to ensure you are focusing on the right things at the right time). All unimportant items should either be delegated to someone else or removed completely. 5. Organize help. Autism moms have a tendency to try and do everything themselves, and as comforting as it is to feel as though you have control over every facet of your life – and the lives of your children – learning how to let go and allow others to take care of the little things is essential in helping you remain balanced. Assign age-appropriate chores to your kids, outsource the things you don’t have time for, and stop sweating the small stuff. 6. Get more sleep. Getting 8 hours of solid sleep each night is difficult for the average parent, let alone parents of autistic children, but few people realize just how important it is. Chronic sleep deprivation leads to a whole host of health issues, like heart disease, high blood pressure, diabetes, and stroke, and it has negative effects on weight gain, cognitive impairment, and symptoms of depression. It can also zap you of energy, increase your feelings of frustration and irritability, and make you more emotionally volatile. Of course, autism and sleep disorders tend to go hand-in-hand, making it next to impossible to get 4 consecutive hours of sleep, let alone 8! If this sounds familiar, consider trading off with your spouse for night wake-ups/weekend sleep-ins so you each get a few nights of uninterrupted sleep each week. If this isn’t possible, schedule cat naps while your child is in school, therapy, or engaged in quiet activities at home, and consider going to sleep and waking up at the same time as your child each day to try to increase the amount of shut eye you’re receiving. 7. Connect with other parents and caregivers. Being the parent of a child with autism can be very lonely, and finding ways to connect with other autism moms and dads who understand the ins and outs of special needs parenting can make you feel less isolated. Whether it’s having someone you can trade notes with about different therapy options, being able to enjoy playdates without apologizing for meltdowns, picky eating, or inappropriate behaviors, or having someone you can call when you feel overwhelmed, establishing a connection with the autism moms in your community – or via online Facebook groups or forums – can go a long way in helping you feel accepted and less alone. 8. Have a plan. Raising a child with autism can be extremely unpredictable, and if you’re an overwhelmed mom, arming yourself with a plan of action can make a world of difference in helping you feel in control. Of course, it’s completely impossible to plan for every eventuality, but taking the time to anticipate the things that can go wrong – and formulating strategies you can use to minimize negative reactions – is a good starting point. Paying attention to your child’s nonverbal cues, creating a Calm Down Box, using Social Stories and visual schedules, and teaching appropriate self-regulation are all great ways to equip yourself and your child with appropriate tools to use when life becomes overwhelming. 9. Practice gratitude. My final parenting tip for overwhelmed autism moms is to find ways to practice gratitude each day. You can make this a family activity whereby everyone shares one good thing that happened to them at dinner each evening, you can organize a gratitude page on Facebook where you challenge other autism moms to join you in focusing on the good instead of the bad for at least 5 minutes each day, or, if you’re a more private person, you can use a gratitude journal like The Five-Minute Journal to write down your personal wins each day. The Five-Minute Journal is designed to help you train your brain to start and end each day with feelings of gratitude so you can learn how to be a happy and positive person rather than a Negative Nancy, and it only takes 5 minutes to complete. It helps set the tone for your day and encourages you to create change from within while also reminding you to count your blessings and resolve conflicts before the day is done. CLICK HERE to find out more. As I said earlier, autism moms are warriors. They live a stressful, unpredictable life in which they must watch the people they love the most struggle in ways they can only imagine, and while they’re desperately finding ways to give their children a better life, they must do it in an unaccepting world filled with judgment and unsolicited advice. Are you going to keep drowning, or are you going to make a commitment to make yourself a priority so you can be a better mom (and wife) to those that matter most? If you found these parenting tips for overwhelmed autism moms helpful, please share this post on Pinterest! And if you’re looking for more autism-related tips and tricks, please follow our Autism and SPD board, where we share all kinds of helpful advice we find each day!